Scott Herren has unveiled the final installment in his spring trilogy of albums. Ironically, however, it has gone on sale before the two previously-announced projects by Prefuse 73 and Diamond Watch Wrists. 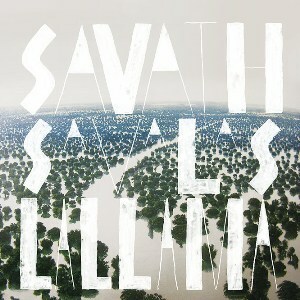 Savath y Savalas’ fourth album, La Llama is already on sale in digital form at Stones Throw’s website. The CD and vinyl versions hit retailers on May 19. La Llama features the return of former girlfriend Eva Puyuelo Muns, the vocalist who inspired the group’s second and most popular album Aprop’at. Electronic beatmaker Roberto Carlos Lange (Rom, Epstein), the third and newest member of what now appears to be a trio, co-wrote most of the songs with Herren. Stones Throw: You talk of ‘the early 70s independent music scene that had briefly flourished in Recife, Brazil and neglected-visionaries like Marconi Notaro, Flaviola, the revolutionaries Lula Cortes and Ze Ramalho as having an influence on La Llama. For the uninformed and in your own words can you talk about that time, the people and what they mean to you? GSH: These influences from the Recife music scene can be seen as direct and indirect influence. The feel of that time and scene, from a musical and independent aspect were far less produced and open ended opposed to other Brazilian releases at that time. Those albums feel as if they are in an environment of their own, the kind in which the surroundings and atmosphere play an equal role in the music written. Although, there are many many factors that come into play as far as influence regarding Savath & Savalas. Eva Puyuelo Muns and I started by simply figuring out ways to make new songs in Catalan and Spanish by studying an array of older folk records as well, like: “Juan Mañuel Serrat” to “Paco Ibañez” without turning our own creations into horrible desecrations that can be interpreted as what I call “hotel lobby music” i.e. the type of pre-marketed “world music” project by placing a watered down preset beats and sounds while adding lyrics in other languages, more suitable for commercial licenses and synchs. In our situation, we wanted to explore previous atmospheres while creating new music with a strong grip on it’s timeless elements. We express our music through our language we speak based on our direct cultures, opposed to some “conquistador esque” product that some rich dude in an overpriced cardigan asked us to do for a big budget with a co-op promotion with starbucks. As far as my own foundation as a producer, I see a producer such as J Dilla or Madlib in the same light as I would Arthur Verocai, Axlerod or any other significant arranger from any time in history. Therefore, it all goes into the mix at some point. The most important part for me is that this project would never be sen as a Prefuse 73 “side project” or carry the stigma of Prefuse 73 due to the exchange between Eva and myself. This entry was posted in News and tagged Savath y Savalas, Scott Herren, Stones Throw. Bookmark the permalink.